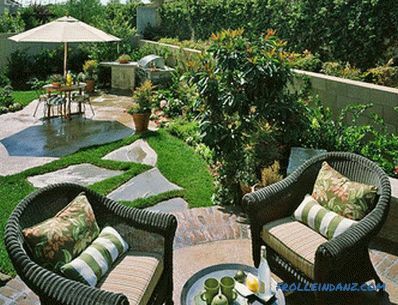 Patio is an equipped outdoor area among beautiful plants designed for relaxation. 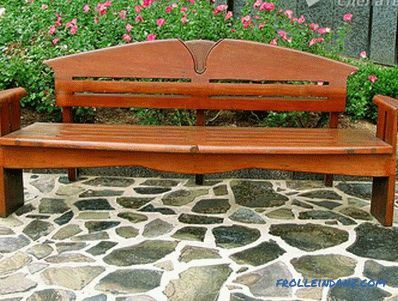 The main elements of such a corner for recreation are a flat, paved with natural materials playground and comfortable furniture. Today it’s almost impossible to imagine a country house without such open spaces. Creating a secluded corner of rest from the city bustle, the owners try to plant their favorite flowers, trees, bushes. Cottage is not necessarily a place to plant vegetables and fruit trees. And when there grows amazingly beautiful plants, how not to build a patio? 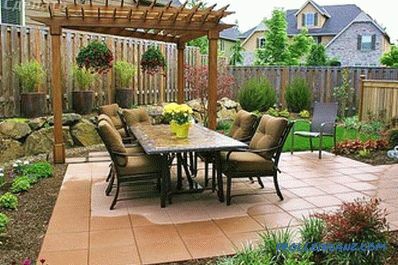 Let's start building a patio in the country, using the step-by-step instructions and recommendations of experts. Carefully study your summer cottage to determine the location of the patio. If you want to sunbathe or bask in the warm sun, the ground should be open - without trees growing around. 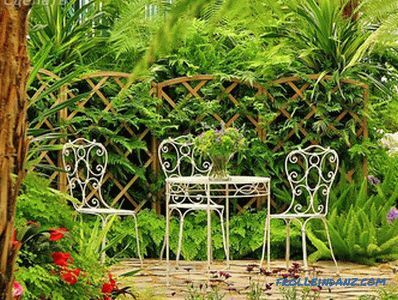 Assume a rest with a cup of coffee and a favorite book on the patio, hiding from the hot rays of the sun - build a platform next to luxurious trees with an open view of a beautiful alpine hill or an unusual beauty flower bed. 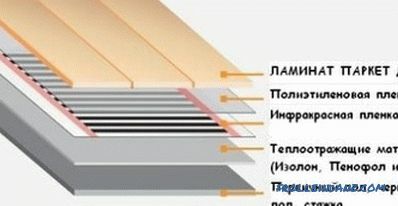 The main requirement is a flat ground. If in the place chosen by you there are roughnesses, it is necessary to work and carefully to level everything. 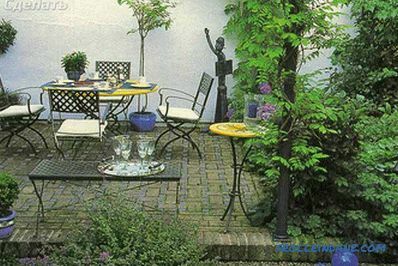 Patios can have a different shape: square, rectangular, circular or multi-faceted area. Mark the boundaries of the future site using pegs and a rope. Round shape can be marked with a hose. With a shovel in hand, dig a shallow pit without protruding beyond the boundaries. No need to dig too deep. It is enough to deepen the site by a maximum of 20 cm. Now you need sand to fill the foundation pit. Level the ground well and cover with water. Wet sand will drain and thicken. It is necessary to level the surface again. If the sand pad turned out to be a little higher than the ground level, it is not scary. 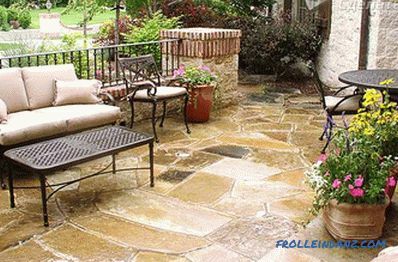 Basically, different stones or slabs are used for the construction of the patio. Sometimes the site is made of natural wood, but in this case the structure will need more thorough care. 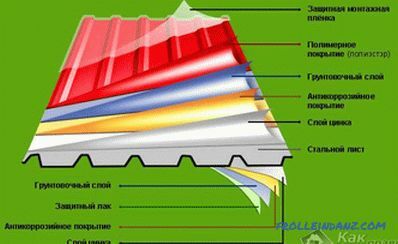 In our article we consider the option of construction of stone. Which stones should I choose? There are not any special recommendations. You can make a patio with absolutely any stones. Whatever stone is preferred, the finished site should be almost flat. Do not test your feet and lay out the area with sea pebbles. 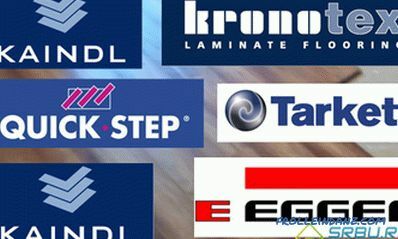 When it comes to natural stone, it means a stone with a flat side, so that you can safely walk on it, and not stumble. The patio is laid out of tile fragments in an unusual and rather original way. Use a circular saw to cut the board or break it with a chisel. Pieces are assembled as a mosaic. With this clutch you will save well. You don't have to buy a whole new tile, and a broken one and a used one costs much less. 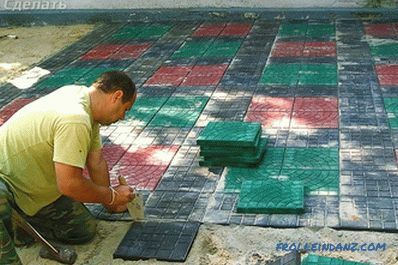 To break a tile into pieces, first determine what shape a piece you need and draw a line on the tile. Chisels along the line make a small recess. Put the tile on the bar so that the break line is on the edge and hit the material well. You will have two pieces. If there is a need to continue to break the tile into smaller parts. When you put all the stones and the marked area will be almost ready, pour sand on top. It should be well placed on the entire surface. The sand will fill the gaps and help smooth out irregularities. Now you need to remove the excess sand and fill the pad well with water. Repeat the procedure three times. Very soon, the patio will be fully operational. It is time to remove the pegs and ropes. Tamp the ground around the new site. Do not forget about the path leading to the patio. 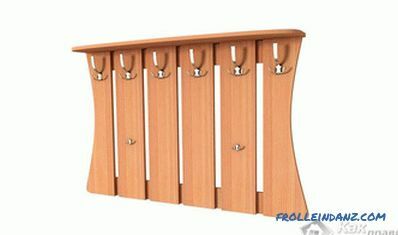 It is advisable to make it from the same material that was used for an outdoor recreation area. The moment came when you could arrange the furniture . 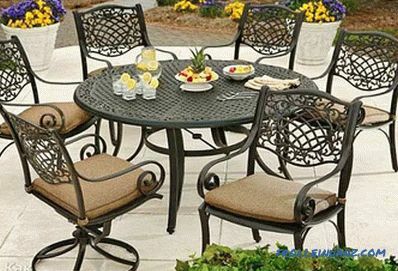 Usually on the patio set a small table and two chairs. If the size allows, you can put a small sofa or a bench with a back. Most importantly, the furniture should be comfortable. Trying to merge with nature as close as possible, do not use furniture made of plastic or other artificial materials for this recreation area. 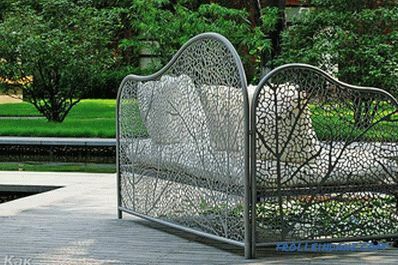 It is best to arrange the patio with wooden furniture.The wrought-iron furniture with decorative pillows placed on the seats looks unusually beautiful. 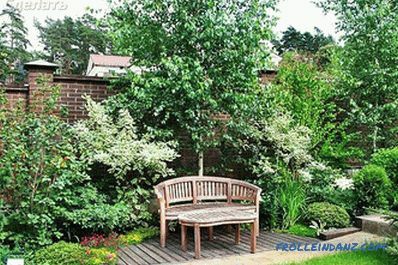 If near the growing trees are still too young and do not give shade, you can install a light canopy. Plant favorite flowers and bushes around the recreation area. Continuing the decoration, do not forget to bring lighting to the recreation area. It is a pleasure to sit in the evening near the fountain in the hot summer with a cup of tea or a cool drink. 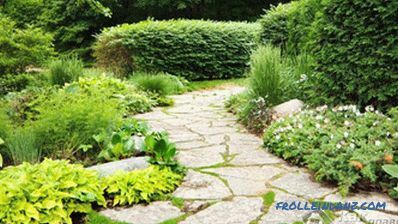 When creating your landscape design in the country, build a small pond or a small fountain next to the patio. Nothing has a calming effect on tired nerves, like the quiet murmur of water and the barely audible rustling of leaves. This holiday destination will be just awesome and will become a favorite place for all family members. We recommend to see examples of design of such corners of rest by other cottage owners. 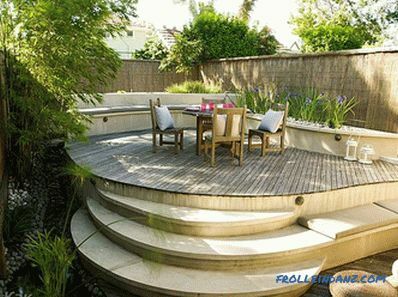 Maybe you will like something, and you will take an idea for your patio. how to build a gazebo (drawings). There are new ideas for design? Leave comments on the article. how to build a pool in the country. We offer to watch a video on creating an amazing recreation area.